The Multi Quick 9 hand blender is equipped with the world's first active blade technology! The blades moves up and down and blend even the hardest foods, with 2.5 times more active cutting zone and up to 40% less effort needed. The Multi Quick 9 hand blender gives you controllable and powerful blending with Powerbell Plus technology for extra milling blades and for less pre-cutting. Due to the smart speed function, you get effortless single handed use to change the speed without interruption. Along with the hand blender, you get a 600 ml BPA-free plastic beaker with ml and fl oz measurements, a whisk, a Purée/masher, a food processor and a chopper to chop meat, hard cheese, nuts, herbs and carrots in seconds. The Multi Quick 9 hand blender is equipped with the world's first active blade technology! The blades moves up and down and blend even the hardest foods, with 2.5 times more active cutting zone and up to 40% less effort needed. 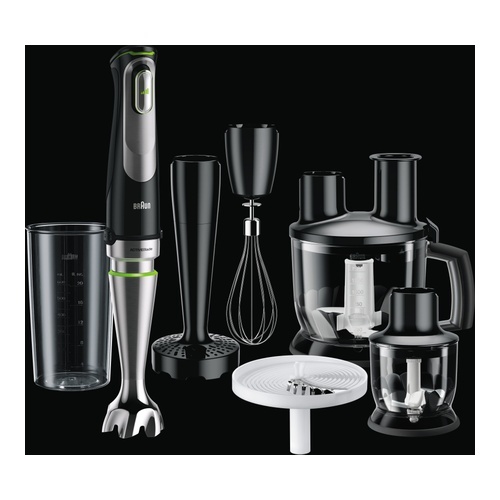 It comes with a 600 ml BPA-free beaker, a whisk, a Purée/masher, a food processor and a chopper.